Jen, Carmen’s daughter, has been an integral part of Hampden Optical since 2004. She started working part-time while attending HACC and went on to earn her bachelor’s degree in Management from Penn State. 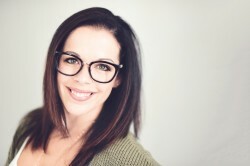 Jen has gained a wealth of experience since joining our staff and has become well versed in optical knowledge. She is now an optician and manages all aspects of the business. Her strong sense of fashion enables her to assist both men and women in selecting frames that suit their face shapes, as well as their personalities. Jen is also the buyer of our ever-growing selection of eyewear and runs all social media platforms. Jen and her husband, Jeff love being at home with their three fur-babies. They also enjoy Penn State football & trips to the beach. "Excellent friendly and personalized service in a relaxed, no rush atmosphere! I can’t wait until my new frames and lenses are ready!"